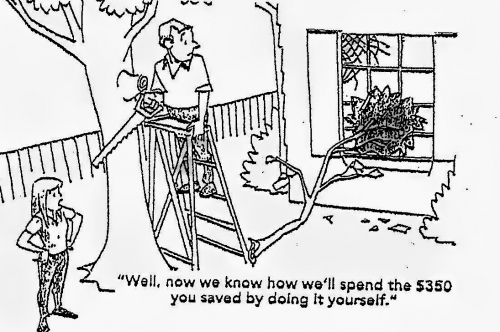 For the DIY (do-it-yourself) homeowner, outsourcing tree work may seem like an unnecessary added expense. However, the costs of tackling tree care on your own can result in poor results, damaged property and personal injury or worse. Most homeowners lack the proper tools, adequate knowledge or practical experience necessary to safely execute their own tree care. Tree work is inherently dangerous and the inexperienced can easily and quickly be severely injured. Often what seems like a simple undertaking, results in disastrous unintended consequences. Lack of Knowledge and Training - Safe tree work requires extensive knowledge of tree physics and biology, which can take years of experience and study to acquire. For example, felling a tree in a controlled manner is not simply cutting through the trunk with a saw. At a minimum, it requires establishing an adequate drop zone, making precise cuts, and often guiding the tree safely to the ground with ropes for rigging or leverage. The inexperienced often cause preventable damage and injuries when the tree falls in an unexpected direction. Other hazards may be invisible to the untrained eye; decayed trunks and limbs, pest and fungal infestations, and other structural defects may only be identified by an experienced arborist. Poor Situational Awareness - Even those who know their way around trees may still fall victim to nearby hazards. Electrical wires are a common situational hazard; many trees grow near power lines and have branches, leaves and limbs entangled in live wires. Serious injured or death can occur when one comes into contact with an energized line, directly or indirectly, through tools or tree limbs. Navigating this danger is challenging, even for professionals, and should never be attempted by homeowners. Many homeowners further impair situational awareness by working alone. If you do attempt tree work, always make sure there is at least one other person working with you. Most trained tree care professionals work in teams! Improper Use of Tools - Homeowners who use incorrect, faulty or complicated tools may hurt themselves and others while attempting tree work. Chain saws are incredibly dangerous and quite easy to misuse. 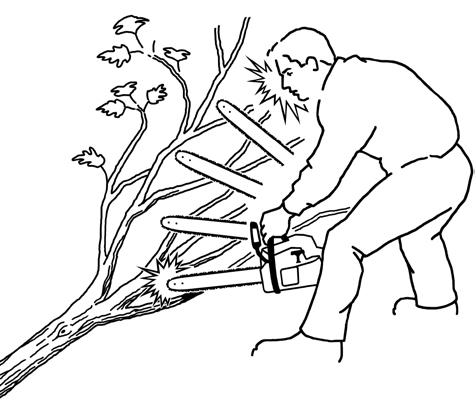 For example, homeowners may be unaware of the danger involved in using a dull chain saw to cut branches on the ground; this can result in chain saw kickback, and serious injuries, when the bar tip hits the dirt or other foliage. Ladders are another common source of injury. Using a ladder that is too short, set on unstable ground, or supported by a faulty limb can easily result in falling. Ladders are often knocked out from under the user by the same limb that was just cut. Hire a Professional - Tree work often requires experience, technical competence, specialized tools the average homeowner does not have. Stump grinders, wood chippers, and aerial lifts are just a few examples of complex and common machines for trained arborists. Need help with your tree care project? Hiring an Accredited Tree Care Company is the best way to ensure that the job gets done safely, correctly and efficiently. Click here to learn more about the importance of hiring qualified tree care professionals.